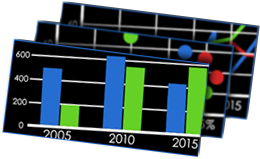 - an online, database-driven education solution for recording notes, distributing project feedback, assessing students, and instantly viewing custom trending data with multiple charting options. With a simple and intuitive interface, it's easy to share your student data using our secure database system. Compile project notes and grades from your entire faculty team and email all your students in one click. Assess students by name, class, semester and year - and generate comparable bar, line and scatter charts across multiple years. CritGo Software works across all browsers on both Windows and Mac - even tablets and mobile phones. Critiques have never been easier. 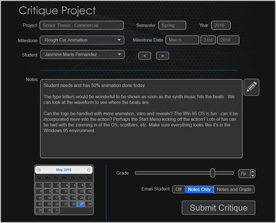 You organize your projects into milestones and all the students included are accessible via a simple pull-down menu. Every department instructor's notes and grades are instantly archived to our encrypted database for later sharing and distribution. You can even immediately email your critique feedback directly to the student (notes, grades or combined) without leaving the screen. Chose one, some, or all the students and instructors in the project to send custom, fully-compiled notes and grades. CritGo Software will automatically collect and organize everything and send only the information you want. 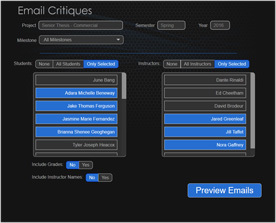 You can even add additional notes after the critique to individual student emails. Send feedback from one milestone, or every milestone in the project at the same time. You can even omit grades and instructor names. How well are your students doing over time? How effective is your curriculum? Every student in your department can be individually assessed by semester and year - with a separate score given per instructor. 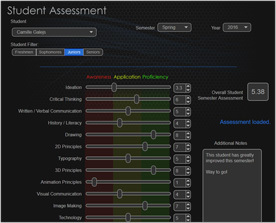 Use our assessment model (Awareness, Application & Proficiency with specific areas of study) or build your own with up to fourteen user-defined criteria. Instant score feedback and additional notes per students are also supported. Visualizing educational effectiveness and success is the key to CritGo Software. Measure your data over time - compare full classes, semesters and years and see how they stack up against each other. Instantly see where the student body strengths and weaknesses fall using custom bar and line charts. Comparing grades is just as easy - with pie and scatter charts and one click. 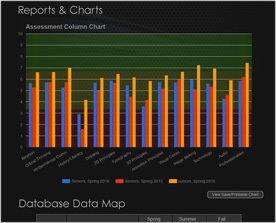 The Data Map even shows where and how much of your assessments exist across semesters and years. 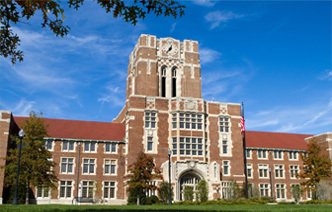 CritGo Software is an ongoing project to continually bring visual organization and ease-of-use to educational institutions around the world. Authored by an educator, we're passionate about quality teaching experiences and additional features are being added all the time. For more information or enroll your department in a free 30-day trial, email the team at Inferno Visual Effects today!